The MB663 Series has a new user friendly Screw-less design. User can just plug in the hard drive and play. 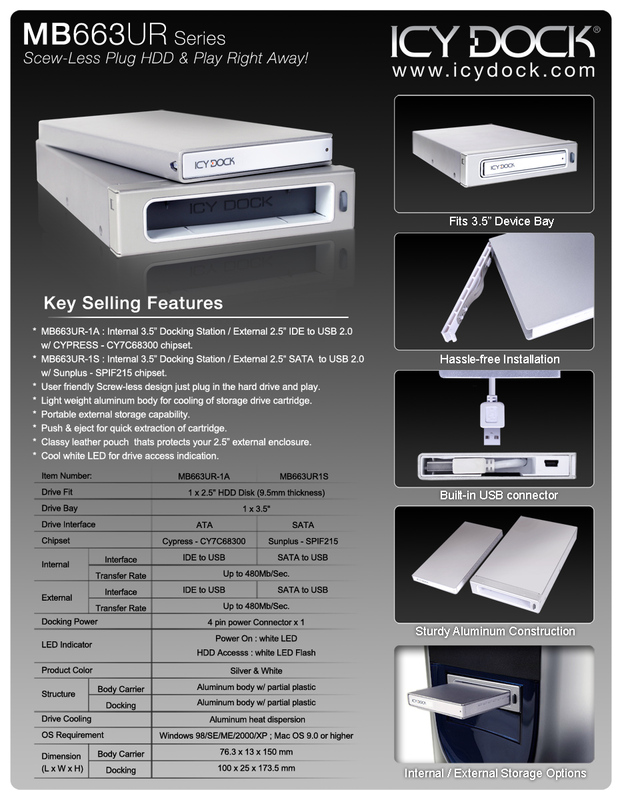 MB663UR series is a 2.5” hard drive removable rack that fits into a standard 3.5" drive bay slot usually for floppy disk device if your standard 5.25" drive bays are overwhelmed by CD, DVD or so devices that you are unable to fit other storage drive devices into your system. Conforming to the idea of a 5.25" removable drive rack, the slim device keeps security, exchangeability, expandability, manageability available without sacrificing the needs of your 5.25" drive bays. Add-on data/ media files storage to laptops and desktops, DVR systems & on field imaging from surveillance DVR recordings, interchange of data between corporate/school/home workstations, data file backups.